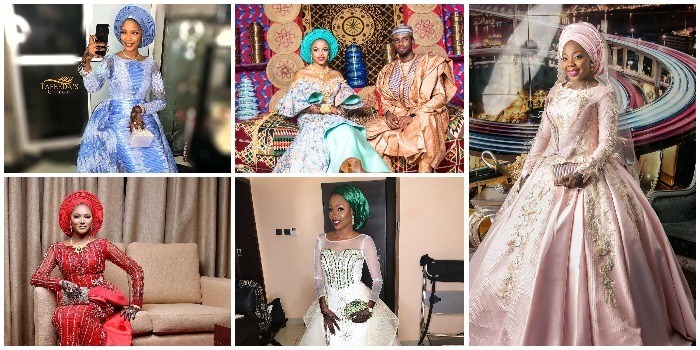 You are sure to love these northern bridal outfits of these 8 Hausa brides. The northern wedding is usually a couple of days’ event, as they also mix their culture and religion since it is the joining of families and not just the bride and groom. The wedding itself is called the Fatihah and just like other tribes the bride is decked to the teeth in her attire and jewelry. The northerners do a lot of gold when it comes to accessories and unlike the other tribes where showing some flesh is allowed, the northern bride is well covered in lengthy garbs and has on a head cover and veil as well. Most brides also have on the “laale” traditional henna as part of the bride’s adornment for her big day. Let’s take a look at some of the outfits that made our jaws drop.